In the competition between bikes and skateboards to be the top means of foot-powered transportation on campus, bikes just got a big leg up (so to speak). 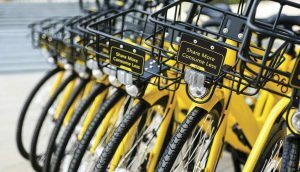 In February, Pomona College and the dockless bike-sharing company ofo rolled out the firm’s first college pilot program in California. Founded in 2014, ofo is the world’s first and largest station-free bicycle-sharing platform. To date, the firm has connected over 200 million global users with more than 10 million bikes in 20 countries. What makes this bike-sharing program unique is that ofo’s signature yellow bikes are unlocked by way of a smartphone. They can be shared among riders and parked at any bike rack on the campuses of The Claremont Colleges. To celebrate the February launch of the partnership, all rides for students, faculty and staff were free during the bike-sharing program’s first two weeks of operation.